Captain William Moore is probably the most famous Skagwegian in all of history. That’s because Moore was the first person to ever live in Skagway. In 1897, he started building a cabin, which was the first dwelling ever built in Skagway. Moore’s entire family lived in this cabin, and it still stands today. That’s why we have the Moore House Museum. You could argue that there is no Skagway landmark as well knows as the Moore House, so it’s kind of crazy that in the 23 years I’ve lived in Skagway, I have never once set foot inside. Obviously, I can’t tell you much about the Moore House Museum from a first-person perspective, so I’m going to have to make some assumptions in this blog. The museum is one of about 30 operated by the Klondike Gold Rush National Historic Park, and you can visit it when you come to Skagway on your cruise or whatever. I drive past the cabin a least a few times a week, and it definitely looks like a cabin. It’s made out of logs and wood and you get the feeling it would have been pretty cold during the winter. I’m relatively sure there is also a bunch of old stuff inside because that’s what museums are all about. Let’s speculate about what may be in there! The Moore House Museum is full of wonders! When you first walk inside of the Moore House Museum, you can’t help but notice that it’s full of stuff. I was able to find some pictures online and there’s a desk in there with some papers on it, a bunch of furniture and photos, which is kind of weird because who would move out of their cabin and leave their stuff behind? It makes me think that the park is up to something. The Moore House Museum is nicer on the inside than the outside. Just look at those drapes! Take a look at this photo taken inside the museum. I found this photo on Google. You can see some of the stuff I was talking about. There is what looks like a dead eagle hanging from the wall for some reason. If you look closely at the photos, there is one of a woman and one of… Hold on a second. That looks like a Bigfoot! Let’s take a closer look at that! Was Captain William Moore part Bigfoot? Skagway was founded by a Bigfoot! Take a look at this photo after zooming in. That is definitely a Bigfoot! 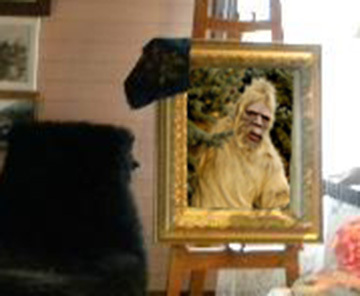 Considering the prominent placing of this photo in Moore’s cabin, you have to assume that William Moore was either part Bigfoot or at least friends with Bigfoots. Pretty amazing stuff! 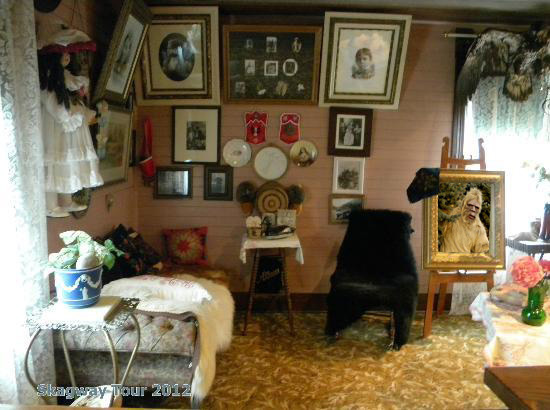 The Klondike Gold Rush National Historic Park obviously dedicated the Moore House Museum to Moore’s familial Bigfoot relation. Perhaps it should be renamed the Bigfoot Museum of Skagway! Other parts of the museum presumably feature plaster casts of giant footprints, DNA hair samples that defy classification, and empty cans of grape soda found in the woods (Bigfoots favorite drink is grape soda). If you’re a fan of cryptids and other unexplained phenomena, you’re going to love the Moore House Museum. Someday, I am going to venture inside and see the exhibits for myself, but for now, I’m just going to accept this blog as absolute fact.